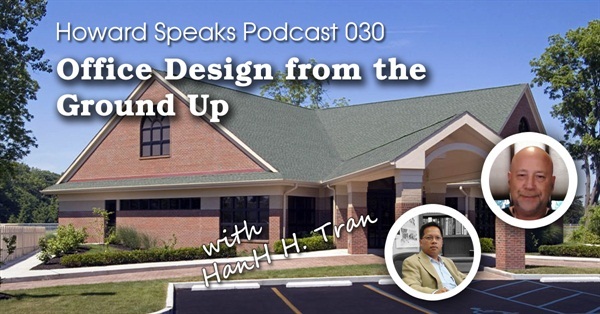 HanH Tran and Dr. Howard Farran discuss common pitfalls of office design and layout. The biggest problem with having your suppliers design your dental office for free is getting what you paid for. Mr. HanH Tran is a Co-Founder and the Design Director of HJT Design Group Limited. Mr. Tran is a dedicated architectural management professional with in-depth knowledge and experience encompassing an extensive project portfolio, across a spectrum of industries, complimented by excellent interpersonal relationship building skills and sound problem solving abilities; fulfilling facility design requirements for both international and domestic clients. Mr. Tran’s responsibilities have encompassed Business Affairs and Development, Project Management and Leadership, Cost Control, Procurement, Regulatory Compliance, Policy and Standards Development, Staff Mentorship, Agency Review, Disagreement Resolutions, Design Seminar Programs and Presentation, Feasibility Studies, Project Programming, Construction Documents, Bid and Negotiation, Construction Administration and Site Observation, Project Close-Outs well as the important considerations one needs to know to have a perfectly designed dental office. Mr. Tran’s Project portfolio includes but is not limited to: Corporate Offices and Headquarters, Historical Rehabilitation, Healthcare, Penal and Justice, Education, Museum, Technology Centers, Security, Manufacturing, Food Processing, Dental Offices and Laboratories, Commercial and Medical Office Buildings, Financial, Retail, Religious, and Single and Multi-Family Residential. HanH Tran is the moderator of the Dental Office Design forum on Dentaltown and a valuable contributor to the Dentaltown Message Board. Howard Farran: Okay, today is going to be a very fun interview, Mr. HanH Tran, in the fact that sometimes we do clinical dentistry, implants, root canals, sometimes we’re talking about practice management, but you...are absolutely the leading world authority on actual office design. And you put in a Continuing Education course on, Dentaltown about office design that’s truly amazing. you’ve been a townie for a decade with thousands of posts. so are you, so how are you going to approach this area? You talking to the dentist who, is going to build an office from scratch, a dentist that…how do you…what do you…how do you want to approach your expertise today? HanH H. Tran: Well, you know, some labs, so many like to do brand new, , no, I’m going in from scratch, but you know, that is a pretty small percentage of, practitioners that have that different need. there are more, you know, with the, with the, rough economy, certainly there are more renovations, than brand new construction. So, if I’m trying to approach a client, first of all, I have to find out what their different needs are, whether it is just a simply freshen up the place, with a new coat of paint and and carpet, new materials and things like that, just to give it a little bit of new light, then we can do that. but or, if they want to, they have spatial problems that they are, just can’t stand it anymore and they want, they want change, but minimize the disruption to the practice a large investment of money, we can also help to, take care of that, too. But yeah, every, you know, uh somebody always looking for opting to do, everything from the ground up, and you know, and do the things that really create a dream practice that the, practitioner had been working to have for 10, 15 years in the making. So, whatever their need is, that's where we start. Howard Farran: Well, I, my main thought on this is basically that dentists emotionally think debt is bad, but debt for a land and building and dental practice is investment. Debt in a land and building and home, is, is, is a bad deal, and you’re going to spend, you know…there’s 116 hours in a week, you’re going to spend a third of your life, of your waking hours, in a dental office, and you routinely see dentists renting 1,000 square foot crappy old office, and then they live in a three or four thousand dollar, very nice home where they own the land and building, and it kind of reminds me when I drive to the, some of the poorest areas, around the world where their car is worth three times more than their house, and it’s like, dentists really need to understand that, to be happy and healthy and vibrant and growing, you’re, you should own the land and building, and your dental office should be bigger than your house. And if your house is twice as big as your dental office, I, I just, I just can’t agree with that at all. HanH H. Tran: Well, now Howard, I think it’s an interesting perspective. I mean, outside of your professional life, you have your personal, meet and compromises, too. I think most of us have family, and you know, you work so that you can provide a comfortable place for your family to, reside in, so where you work, I mean you afford to have a, you know, a sprawling estate for your family, I think that’s great. but when you invest into real estate, and building for your practice, you know, it’s not an expense because, again, you say that you spent a third of your life, more than, you know, more than a third of your waking life, working and you’re at your office, so you should invest in it to, to provide the most comfortable and most effective, a type of facility that you, that you come to every day, that where your staff and people depend on you, to have so that they come for treatment and things like that, so I, I mean, you know, if your house is three times bigger than your practice, more power to you, but when you look at your, you know, having your practice, it should be invest…it should be, uh approached as an investment, for the long haul. You don’t build a practice so that you can move every five or ten years, you build it so that you can stay there and grow and expand as you need it, so it should, you know, we dentists should, invest more time and research into the locations and the facility they need. I think that’s an area that a lot of dentists not invest in, into looking at, what they ultimately need and want, because every time you move, it’s going to affect your practice. Howard Farran: I would say that, in my 27 years of listening to other dentists, the number one complaint with every dentist I’ve ever met with their new office is five years later, they say they wish they would have had another operatory or two. They always go so small. I don’t I can count one dentist that said, Man, I made my dental office too big. I have too many ops. I wish to heck I wouldn’t have gone so big. is that the feedback you’re hearing? HanH H. Tran: You know, it’s funny, we designed an office for Dr. _____ that has twelve operatories, and he said, I wish I had more. you know, guess if you build, you build too many and the practice didn’t grow, you know, as you need it, or the economy tanked, you say, Gosh, I think I built too many. So, it’s kind of… it’s a gamble, but if you plan to grow and stay there and, you know, and expand, you’re… part of your building plan should be to give you the opportunity or the option to also expand as you need. yes, you can over, you can over, you know, build, but yeah, I, I, you know, I’ve heart of that same complaint, but there is…if you don’t plan it right, then you can’t exercise the option of being able to expand your facility, physically expand your facility. Howard Farran: I think it’s funny how, according…the average overhead of a dental office is 65%, so that means the dentist is getting 35%, labor, in rural is closer to 20, in urban closer to 25 to 28, so labor’s another 20-28, so we’re looking at about 55% labor, and in every dental office I’ve ever been in, all the expensive people, the dentist and staff, everybody’s waiting for a room, everybody’s waiting…Well, as soon as get the lady out of Room 4, then we can, flip that room and…don’t worry, doc, just stand there doing nothing and we should have your next patient ready in 15, 20 minutes, I’m thinking, Gosh, the facility cost, that’s under 5%, why is 55% labor standing around for a 5% facility cost? The doctors that go operatory long and can always walk out of one room and walk into another fully loaded room, they’re always far busier, and secondly, the front office, every day, someone’s got a toothache, an emergency, whatever, and they can’t find a chair to put this person in. and the dental offices that I see that have an emergency room, so the front office doesn’t have to be coordinating with all the assistants, the dentists just say, Well, just come down and, you know, in our office, Room 4 is never scheduled, it’s an emergency room, so I can have four receptionists at the front desk being on the phone to say, Well, come on down right now, they’ll just put him in Room 4, and we go in there and just look at it and give him antibiotics and pain pills and be out of there in two minutes, or that person might land right when someone else doesn’t show up, so the, the entropy random chaos of an emergency patient exactly neutralizes the crazy, realities of life that someone misses their appointment, so that’s a balance. And then sometimes, we just work harder, and so, well, tell me, this is your expertise, not mine. just tell my viewers, our viewers, what should they be thinking about a remodel, a new office? What have you picked up? what are your low-hanging fruit takeaways on office design? I told you mine, bigger than you think, always have an emergency room, be true to your cost, you know, your, your operatories aren’t your cost, people are your cost – yourself and your staff. What takeaways would you like to give them to think about? HanH H. Tran: Well, I think it’s, when you.. .first of all, when you design a facility, you know, you have to do…I think…I like to point out the, the aspect that if you have to first create a program of what it is that you need, okay? What do you need now, project how you’re going to grow, and what you need down the road, and how we can accomplish that, that growth. You hear, you know, you hear discussion about, you know, if you need, you’re going to have a seven operatory practice, just build it out and only furnish two or three, and as you grow, you you can commission those empty, you know, treatment rooms into actually when you need it, where by then, you basically building a larger facility that, that you don’t need until, until you…and you pay for all of the expenses to have that. I think you have to start with what, you know, a program of what is it you want, what is it you need, and then you, then you plan and design around that need, okay? it, it all has to do with your business program and the design, and you design a program for your facility so then you can meet your needs and your facility’s needs as you grow and as you expand. Does that make sense? Howard Farran: Yes, it does. what are you thinking, of other things besides size and future growth and all that, what about like, architecturally operatories? I’ve been in dental operatories that are 15 foot by 15, I’ve been in others that are small. I always have the same thought, that if you’re going to spend a gazillion hours in here doing a root canal, why are we, why are we having to turn sideways to get between the door and the cabinet and you know, I’ve seen some offices that say, Well, the assistant only needs a three-foot wide door because if someone’s in a wheelchair, I mean…some of these…I call that theory Thinking Japanese, meaning that in Tokyo where land’s a million dollars a square meter, your facility cost is so high, that you literally have to learn how to build a dental office in a closet. But, in the United States, in Canada and Australia and these big open countries, is some of that overkill or what, where do you weigh in on that? HanH H. Tran: I, no, I think that’s more a cultural thing. You know, in the United States, we like everything big, everything big, okay? The bigger the things that we have or the bigger the toys that we have, the more that our friends and associates and family are perceiving our success. and you know, if, first of all, if you’ve got a, when you build your practice, you build it for you and your staff. So, I think it’s…I think part of the shortcoming that I find is that the communication between the team. I’m talking about the team that’s in group, the dentist and his staff, the assistants and, you know, the whole staff, they don’t…they don’t bring them all together and brainstorm about what is your, what is it that you’d like to have or what do you think that we need to improve so that our next facility could have, would have less of the headaches that we deal with now. it’s kind of humorous that, you know, dentists want to design a new, a new facility because they’re expanding or they need that, they need that additional production capacity, but they will take the same stuff that they’ve been griping about for the last 15 years and reintroduce them to their new facility. They don’t look at the new facility as an opportunity to shed all this crap that they, that they’ve been complaining, griping about. So, when…so communicating with their team, their team can actually add a lot of value to the things that they improve. They are the leader, but they don’t necessarily have to be the only decision maker. And the more…the more that you can get out of your team, the more that, the more contribution you get from your team, the more that they feel that they have a little bit of ownership that they feel that they have some value in your position and have the freedom to review and critique and add to the value of your ofice as they grow because, after all, you’re not the only that’s spending a third of your life there, they’re also spending a third of their life there with you. Howard Farran: And that is my management style. I’ve always said, you know, I lead from behind, and there’s nothing that I, do more than delegate out, I mean, I, every time someone asks me a question, I always think, Well, how would you ask that question if you owned 10 McDonalds and you just asked that to Ray Kroc, he’s six feet underground, why are you asking this question at Wal-Mart when Sam Walton’s six feet underground, and the same dentist that always complains that he wears too many hats, is the same one that doesn’t push decisions out, and you’re right, it gives the staff ownership, it’s creativity, it’s brainstorming…go through the long laundry list of, things you’ve seen over the last decades doing this ,what facility issues were bad in the first office and they’re reintroducing. Go, go through those. HanH H. Tran: I think the…every…you know, everybody has their style, how they like things, what, how what makes them happy. everybody has their different personal me, and perception of the, what they want for the facility, what’s the best facility. So, you know, whether, you like or you can operate in an operatory that is only 6 feet wide by 8 feet deep, or you know, 8 feet wide and 11 feet deep, or 12x13, that is more of a personal, decision and choice, and if you can afford a little extra elbow room, do so, okay? And when you look at your facility a lot of things that I like to, to fine tune is this – when we talk about ergonomics, when we talk about, efficiency, effectiveness and stuff like that, I, I look at…a dentist’s office is very much like any other factory, because you talk about production, okay? People come in, or a patient comes in, you assess their condition, you may offer a treatment plan and, and you take them to the processing, get them out the front door. I’m just like a factory making widgets. So, we, we, I believe that being the more compacted design, the better it is. a lot of the complaint that you hear is, it’s noise, and that’s one, that’s one, that’s the biggest gripe. Howard Farran: Noise from what? HanH H. Tran: Oh, noise from, you know, just the, just the buzz in the, you know, in the facility. People talking, or a sound from, you know, from traffic sound, equipment sound and things like that. But, I’m talking to you all, there is a, there is technologies and solution to everything that goes into the building. You know, if there is a sound problem, identify at the beginning of the planning process so that you can implement the proper designs and wall assemblies and doors, and to isolate the situation. You don’t do it afterward. I, what I find a lot of the time is that the jocking of who comes first to the, you know, to the table to start the design process. you, no, the approach is how cheap can I get away with if I want to do this or that, rather than what is the best solution, what is the best technology, what is the best approach, so we’re, so we’re not trying to design a facility that meets all the need, but we’re trying to design it based on a dollar or a budget that a doctor may or may have not established, so you look at…if you’re looking for cheap and fast, I think you’re short-changing yourself. HanH H. Tran: So, when you design, it has to be, you have to look that not just the dental part, you look at architectural, because everything works together as a unit. You can’t have one better than the other and go, Why do I have problems? Howard Farran: Right, and one, one thing I, I think is hilarious about sound is, I think dentists always forget that we have such strong fundamentals and basic science and math, physics, chemistry, and biology. I mean, I walk into restaurants where they designed, tile floors, you know, hard walls, straight ceilings, they don’t realize that, you know, Dr. Bose, I, you know, he would, you know, Bose speakers, that guy was a sound physicist from MIT, and, and you can’t even hear yourself think because all the noise bouncing around. HanH H. Tran: I think we have to look at the region of the country, okay? So, what is the facility going to be exposed to? IF one’s doing, a, uh…I think it’s great that, that, you know, in Dentaltown you have a lot of practitioners that have done things that you can bounce ideas off of and stuff like that. But, when a person has only a limited exposure to the construction, or the design, their input is valued, but it may not appropriately apply to their friend’s facility. If their facility’s in Texas and your friend's is in Alaska, a building and facility that you've done in Texas, has got to be a nightmare for the people in Alaska, okay? So everything would have to be taken, and appropriately applied based on the location where they're at, the point is, our debate is, is it an investment or an expense, do they have to have a vestibule, okay? HanH H. Tran: A vestibule. Howard Farran: What is a vestibule? HanH H. Tran: A vestibule is that air, that air brake or that chamber, you know, when you’re coming to a facility, you go to one set of door, and then another, the vestibule. HanH H. Tran: Okay? That vestibule make take up less than 50 square feet, alright? But, it, it’s…and if you ever sit in a waiting room, that when the door opened and exposed to the outdoor, whether it is hot or cold, alright? So, in Arizona, you open the door, it may be hot, and it’s okay. But, once you open the door, the bees and the insects may fly in, and then you have a disaster in your waiting room, okay? That vestibule actually only allows so much of the conditioned air, heat or cold, to escape. So, it’s never…every time you open the door without a vestibule, all your money will rush out, okay? And then, in then it turns to in that room will have to be, again, let up to a certain comfort level. so that is an element that a lot of the, a lot debate about whether you should have or shouldn’t have. I personally think you should have. When you track mud into or snow into the building, it doesn’t stop at the door. It goes all the way in. That’s the point where you allow to kick off and stuff like that, that, that’s where you it may contain the discomfort in the adjacent room, the waiting area. When it comes to sound, you have a lot of hard walls, hard floor, there’s a lot of different treatment that you can, you know, you can use, you can use sideboards on your wall, you can use, no, just a lot of…let’s say, acoustic ceiling – you’ve got a drop ceiling. It maybe comes in different grades, so maybe you roll extra money into a higher absorbency type of panel that can absorb some of the sound. Maybe artwork, maybe a tapestry, they don’t say you can do it to at least absorb some of that sound so that it doesn’t bounce all over the place and it just drives you nuts. So, the planning of what it is that you try to achieve should be done at the, at front choice. It’s part of the design, it’s part of the…you know, all of the, the process of trying to achieve things rather than you taking a more proactive approach. Howard Farran: For me, for me, when I opened up, I was renting a space, and there were only windows at the front. There were no windows on three walls, and for me, the neatest luxury, I, I still appreciate, you know, 25 years later, was putting a big window in each operatory. I felt like when I walked into the dental office and it was dark out, and I left the dental office and it was dark out, I, I felt like l, I, my, you know, just sacrificed a day, and when I’m in there doing root canals and fillings and crowns all day, looking out that bright window and seeing the weather and the rain and all the different things, I feel like I’m outside in a park, and I also think that, it’s better taking a shade of a tooth when you have natural sunlight coming into the window. without a window, do you recommend, full UV light bulbs for cosmetic dentistry or do you think that’s overkill? HanH H. Tran: I…Howard, anything that you can do to give you the, you know, the natural light or as close to natural light as possible, it’s a plus. If you don’t have a window and you need to have a window, I mean, a lot of, a lot of practices now are going to a retail strip, so the only window is at the front, okay? If it’s me, I need daylight, okay? I started to grow hair and fangs if I don’t have daylight. HanH H. Tran: but there is, there is technology that you can use and to ways you can design to any simile that so you can, you can have not necessarily a window, but an artificial window per se, okay? Now, your benefits vary greatly if it’s a fake window with, you know, the blinds and everything and slid up and we have a scene and stuff like that. Those are things that you find creative people that implement some of that element into your facility, that will offset some of that cave-like feel. Yes, you know, a retail strip will give you the, a lot of eyeballs to look at because everybody’s going there, so you need traffic that come to…you know, that walk in. But, the sacrifice is having natural light and natural window. You can use Clearstory and bring some of the light from the front deep into the building, you can use skylights if that is negotiated into your lease and you’re in a shopping facility, so you can bring natural light into…and, of course, you know, the, the artificial lighting should be designed so that it will give you as much light as you need, as much light as you want, because I don’t the lack of lighting makes the place cozy, it just makes the place look really, really dingy. Now, I personally…when I see a dental facility that I can visit, I go in and check out, see things. So, I’ve been to a few clinics where you go, Oh my God, it feels like a cave, because it’s so dark, and it’s not just, not just that it’s bad for how you practice, but it’s just bad for your psyche as well when you, when you leave, like you say, and it depends on where you live, when you go to the office to start that and, you know, it’s dark out and you leave the office when it’s dark out, I bet you feel like you live, you know, you live in the dark. if you can’t bring natural light in, there is ways to do that, and so express that to your designer or your architect or whoever is designing your facility, and that way they can implement that to the design and plan for it. HanH H. Tran: You don’t blame them, do you Howard? HanH H. Tran: I mean, when you go, when you go…when I go to a restaurant, I pay attention to, I use the condiment, you know, on the table, and has it been wiped off. Is there a two, two or three day caked on, you know, dried on, caked ketchup on the ketchup bottle? I look at those things so I can assess the, how are they going to handle my food, okay? naturally, as a consumer, you want the best for your, you know, the best for your money and you want to have the best experience. That consumer, doesn’t excuse a dentist from having an unkempt place. When you, when you have a facility, there’s…you have to invest the time in those little details, okay? Like when you walk into a facility and you go, Oh, there it is, there is a week or two weeks’ worth of, of, you know, of dust and/or crust that sits in the corner, that means that the dentist doesn’t care enough to have housecleaning, alright? Now, when you…when it comes to design, the team, your team, should include the people, perhaps include the people that actually clean your place, so that way they can actually give you some input, like okay, carpets a little hard to clean, we find this one will work best, and this one doesn’t, so that when you…so their feedback can also take into consideration of the final, the product that is selected for the facility. So, you know, again, it’s communication, but you know, the perception of what your facility looks like, it’s very important to the consumer, your patient, okay? The…when I design, or when we design a facility, the question or the things we have to be aware of is, what don't our client do, alright? And that means that after you put in all the nice carpet, the nice wall covering, and all that stuff, so they actually clean and how often do they clean? So, that carpet there that’s selected has to, has to endure for that five, ten, or twenty years of use and/or neglect. But, as a business owner, you have to pay attention and give the facility the need, the care that it needs, so that way when they walk in…when the people walk into the facility, they walk into a comfortable and clean place. The chair for instance, alright? They sit on there. I don’t like to share my seat with the last hundred people that have been there that wipe their hand and stuff like that, and the chair has not been cleaned. I myself resist from shaking people’s hand in public because they say, well, are you germaphobic? No, if you want to know how filthy people are and their behavior when they have it, just go into a public bathroom and go into the corner stall and hang out there for a few minutes, and count the number of times the doors open and close, and how many times the sink actually gets activated, and you go, Oh my God, there is like seven of the ten people out there didn’t wash their hands after do their business. Your facility, part of the, part of the, cleanliness and the longevity of the finishes and the look of, and from your facility, are attributed to cleaning, regular cleaning and maintenance. Howard Farran: I want, I want to say something else. You know, having, having lectured to dentists in 50 countries, it is very apparent that everything man has built in the last 5,000 years out of rock and cement is still standing. I mean, you know, whenever you see any, any structure or building in Warsaw or Paris or, anywhere, it’s made out of rock, and then you come out to areas like Arizona where everything’s put together with, boards and chicken wire and, you know, blow stuff, if, if you built a really nice dental office with, ceramic floor, it, it’s probably be there a thousand years later, but if you built it out of, plywood floor and threw some carpet over there, it’d have to be replaced regularly. To me, this is not my expertise as your expertise, but to me, it looks like if you build a dental office once and right, you’d still have a nice building 50 years later without blinking, and again, if you go short-term, cheap, save on some building materials, you, you don’t have a long-term investment. Are there…will you talk about that? HanH H. Tran: Yes, yes, that’s a good point, Howard. I think it has…it starts with the mindset of the client, okay? If you, if you go out and you say, I want to build a building and this is all I want to spend on it, okay, that, well, okay, you establish a budget, but if you didn’t ask that question, okay, if I do, if I do this, okay, what would be the ideal material for, we’re talking about a brand new building from the ground up, okay? So, what is the ideal material to use so that my building, I don’t have to worry about vandalism, I don’t have to worry about all your constant maintenance, what would last me for another30, 40, 50, 100 years? Naturally, it will be brick and stone, okay? It’s an investment. If they’re looking at the quick, cheap, and what can I get away with, then they build it and they’re out there building, yes, you can have this, you can have that, but it’s not going to have the longevity and durability of the, of the material we’re talking about – brick and stone, okay? Naturally, the reason brick and stone was used is because people back then don’t build and say, you know, If I don’t like it, I tear it down in five years. It started with, you know, what is it that you want and how, what is the, what do you want out of that investment? Do you want it to endure so that it lasts for almost forever? Or do you want it just so that it’s there and get it done and then we’ll move on when it falls apart? It’s, it’s an attitude. HanH H. Tran: Well, you know, in the mind… in our mind, the things we build are the greatest things, okay? Until you take that and you compare to others. The approach when, you know, when you look at how the Japanese built anything, they come, they come to the table with a total…with a totally different end result and what they want versus what we want. As an American, we go, Just do it. If it breaks, we’ll fix it. For them, they say, Fix it, build it, then we don’t have to fix it again. Howard Farran: Okay, well, speaking, speaking of that note, why do dentists lay all those lines to the operatory? I mean, water and suction and nitrous and all those lines – it looks like spaghetti, and then pour concrete over it, and then five years later, the land starts to settling and they’ve got broken lines and they’re in there with…I’ve seen them a hundred times with big old concrete-cutting saws. I’m like, What are you doing? They’re like, Oh, we’re cutting down, trying to find the line. We’ve got a leak in the floor. It’s like, well, who designed…I mean, who thought…didn’t anyone think this out, that we probably shouldn’t bury everything in cement? HanH H. Tran: yes. actually…actually I, there’s an old technology where you go into a commercial buildings, you walk across the floor, you can hear it – that little old howl in this floor system. It’s because they had channels, or chase, when channels or chase for electrical chase for all this infrastructure underneath the support material. You have been in a, you know, what they call a computer room, where the floor is elevated and you have the aeronautic stuff? Well, that is that is the technology that allowed you to have everything underneath the walking surface, and you can move everything anytime you want, okay? When we, when we look at dental facilities and the way they’re designed, it’s just short of building a house, okay? HanH H. Tran: Most of the practitioners, that’s the things they compare to. They’re comparing their home to their office because they spend a lot of time there, but they’re not willing to, explore other ways to do things, and they view…and the…part of their challenge also is that when you start to look at more innovative process and design elements, it’s hard to find the, the labor of course, they have to same innovation or the same mind of thinking and experience to execute that, okay? Now, I, I like new things, I like new, all these new systems and stuff, and I worked on a project one time where the contractor that won the bid, when he comes to install that particular piece, he goes, We’ve never done it before, and we can’t do it, but this is what we can do. So, I, instead of having a very high tech, aluminum trim treatment, we have the same old drywall. So, it depends on the, you know, the client, what they’re comfortable with, what they are willing to spend, how long they’re going to be there, and the labor force you have available, and at the same time, also the, the experience level of the designer. Howard Farran: do you, do you think it’s overkill to have a, you know, the dental office two feet off the ground with a crawl space underneath to service all that area, or do you think that’s, that’s overkill. HanH H. Tran: Actually, I don’t think that’s and overkill, Howard, okay? If you look, if…when you travel to the European countries, alright, commercial buildings in particularl, they have what they call a raised floor, and that raised floor is very similar to your computer room. And all of their, HVACs underneath the floor, the, the cool, the grill, the the vent for to provide the, you know, the heat and cool, is under the floor. You can…if you happen to have that office, or that space where you work and you need that air to be closer, you can actually move that duct, okay? So, you have control of that. One, is that it allows the room to be smaller, it allows the, the the structure, the roof structure to be designed differently so it doesn’t have to carry the large equipment, it can be serviced a lot better. So, it, again, it’s not, I don’t think it’s an overkill, I think it’s a different technology that the United States isn’t ready for, but I think it’s, it’s something that’s really worth exploring and worth looking at, because you can move all of this…let’s say you have all your, your vacuum and your nitrous and oxygen underneath the, the raised floor. Well you never have to cut the, the concrete slab, alright? The building doesn’t settle…first of all, buildings shouldn’t settle. The slab shouldn’t settle, okay, if it’s done right. But, if you want to reconfigure your office, you can do that without having to do a lot of demolition. HanH H. Tran: Yeah, yeah. Howard Farran: …eating a sandwich, you know, standing in a hallway. They need to unwind. I mean, you just got done with a very stressful patient who was upset for whatever reason or child or whatever, sometimes it’s just nice to go and lay down. a couch…I mean, gosh, there’s always somebody in a dental office who, might have a no-show or cancellation, is not feeling well, whatever, just wants to lay down. One of my nice amenities we put is a, actually just a picnic table outside, under a huge tree, and God, everybody loves to go out there and eat lunch all through the, the cool winter months in Phoenix, Arizona. So, what other talking points I, uh…we’re two-thirds done, we’re 40 minutes into 60, I’ve only got you 20 minutes left, of your topic talking points, what else do you want to cover in these remaining 20 minutes? HanH H. Tran: Howard, when we talk about dentists’ offices, it doesn’t always pertain to the inside of the building, okay? So, a lot…I think a lot of issues and discussion we talk about, it’s well, if you have…if you built a building, okay, for whatever purpose, let’s…you know, we’re talking about dentists’ offices…it’s not specifically just for dentists. You have people that come in to service you, okay? Let’s say you buy a piece of land and…I, I find this to be a little bit disheartening, is that it’s designed from the inside out. you have people that sell furniture, that, or equipment, that have actually no knowledge of buildings, and they really care about how the building is situated on a site, and so you have to design the building. Now we, we were given a, project where I was asked to do a project a few years back, and it was designed by a, you know, a supply company, and it was, it was brought to us and we thought, Okay, have the zoning issues been resolved. You go, Why? Why, well, because the building sits right on an easement, okay? It sits over the property line, it can’t work. You can’t build your building on your neighbor’s property, alright? So, zoning, it’s important. it tells you what you can do and can’t do. I, the question that I’m always asked is why can’t we have this gigantic sign? Well, because it’s not simply because you can’t, because there’s a set rules that everybody has to follow, it’s called a zoning ordinance. you don’t have to be an expert in it, but the people who design for you should at least read it. They should at least check it, okay? If a patient comes into your office for the first time, and your assistant just grabs the patient’s hand and takes them to the chair and starts the treatment, that would be frightening. You want to know at least a little bit of history of what it is that you’re dealing with. Well, the building is basically the same. So, before you design, you’ve got to check out what you can do, what is the condition we have to live with, and who is going to make your life miserable if you don’t. So, zoning should be an issue that they should resolve. Howard Farran: I, I wanted also to talk about the fact that so many dentists, they’re enticed by a supply company saying, Oh, we’ll design your office for free. And I always say, Dude, you’re in America. There’s nothing for free in America. And then they seem to design it only based on everything they can sell you, including, a gazillion pre-made, fabricated, cabinets, and your office layout is probably more determined on how many pre-made cabinets they can sell you, versus what would be the ideal layout, and I would ask you, what do you think of suppliers designing your own dental office, and is it great to go with pre-made cabinets or do you think it’s, often better to have them custom built from scratch in the remodel, or facility? HanH H. Tran: This is…this is where I get in trouble, okay? My, my…let’s go for it. HanH H. Tran: first of all, would you, would you feel comfortable that your assistants do the extractions? Of course not, okay? Do people that…if they’re…if the supplier’s main focus is to provide you with equipment, then let’s stick with the core business equipment. If you’re going to design a facility, then let’s design it right from the start. There is nothing worse than handing somebody the baton that had been greased, okay? More likely they’re going to drop it. There’s going to be a problem. And if you’re going to design it, make sure that it’s design to code, that the zoning issue is, is, you know, is taken care of, building code is addressed, ADA requirements are addressed, so that way when, when you say, I’m going to design a facility for you, you’re actually designing it. You’re not just laying out equipment plan, okay? So it would become a value for the rest of the team that comes behind. They, you know, you don’t want to have somebody else come behind to pick up your stuff and fix the things you do. That’s what happens when you hand a set of drawings that are done for the purpose of laying out equipment. Not that the, not that there’s not unique individuals that are qualified to do those things within in those organizations. But, that’s not their core business. If you look at any, any document that comes from a supplier, there is a disclaimer on the bottom that says zoning issue, building issues, and all that stuff have not been verified. Well, why not? If you design it, why not? Okay? you’re right. We’re in America, there is nothing for free. It’s somewhere in there… it’s somewhere in there you’re paying for it, okay? You’re the guy that’s buying equipment, there’s a margin that’s big enough that they can throw in a couple thousand dollars at you. So, as far as, as far as cabinets are concerned, well, if you’re in a leased space for five years and saving up so that you can build your permanent, you know, office down the road, why invest into something that you can’t take with you, okay? So, I mean, it all depends on the budget you have and what… if you can build some really, really nice custom cabinets and that will rival any premanufactured. Now, when I got the…now, when I go to the shows, one of the questions I ask is, Can your equipment…if I want…if I decide to put my x-ray unit on the 12 o-clock wall, cabinet, can you do that? And they say, Why would you put it there? No we can’t. Well, then that’s where the custom guy, you know, says, Well, we’ve never done that. I say, Well, we have, alright? We find the cabinet at the cabinet shop that will fabricate for us, and we design it, we engineer it so that it can carry this arm, you have more flexibility. You’re not just…you just…you’re not just buying a prefab cabinet…you know, a prefab unit, that you can make some adjustment. A custom means you can, you’re pretty much set. If you do, if you do a prefab, then they give you, a selected, you know, a, a small selection of finishes that you can, that you can have, because these are the things that you’re only allowed to have, where custom, if you want to go to some exotic stuff because you really want to or can afford to, then custom you can do that. I, I’m not a proponent to say, you know, I’m not going to say you shouldn’t have the prefab stuff or you should have just custom. But, it’s all based on your personal need. it’s options, and one, it costs you, a fraction of the other, and sometimes it’s a no-brainer. Howard Farran: …and instead of having them, I, I’d rather have someone, representing me to design my office than having someone who wants to design it, trying to lay out everything they sell, but one thing I have found interesting of value from the suppliers is, is when you have any exact…say, like a dentist will say to me, Well, I have a, I have a 27 foot by 58 foot or whatever, I say, Well, go to the, go to the, your supplier and ask them for a copy of all the floor plans of that shape and size, because what I have found is that you can do little things like, well, nine out of ten dentists, put a, a patient bathroom up front or this or that or break room or conference…because dentists, dentists are wickedly smart people. I mean, they got As in, you know, calculus and physics and chemistry and bio…I mean, I ran with these guys. I mean, these are some of the sharpest guys on the block, and, and they don’t make fast decisions. They’re paralysis by analysis. So, if you were going to do a specific shape of an office, and your supplier, your, your sundries person can give you 50, just 8x10 blue, you know sketches of the floor plan, man, that’s a lot of brain power that went in to one shape and size, and I, I’ve looked at those shapes and sizes and I’ve always found it amazing, how, you know, they all individually…and that’s the proper way to brainstorm. You know, most people brainstorm wrong. The research is clear – when you pull all your staff into your conference room or waiting room and ask them a question and they start brainstorming in front of each other, the research says it never works. The strong, dominant personalities will go first, the people who don’t want to make a ruckus will just agree. Proper brainstorming is when you tell everybody we’re going to meet at 1:00 to discuss this, I want you to bring your ideas in writing, and then we’re going to go around the room and I’m going to go over what you wrote before you walked in the room. That’s brainstorming, and that’s what’s happening when you get 50 different, 8x10 pieces of paper of the floor design of an exact shape and size. It’s really cool for me. HanH H. Tran: I thought that when, Howard, the danger of, with some of that is when you get so much information, okay, that you can’t let…you can’t decide what will be ideal. You know, I’d like a little of this, I’d like a little of that, and suddenly it’s like, Oh my God, I, I…now where do I start, okay? I, I I would advise, strongly advise when a, you know, when, dentists look at doing and rebuild them, is that take a proactive role in the design of the process, alright? Or whoever you have, you know, whoever you, ask to design your facility…when it…I had also…a designer or architect, be proactive about what you want and what you need. They’ll come to the table and they might have, you know, they may have a, already a plan that they’ve used 40, 50 times across the country, and they say, Oh, it will work for you, too. Well, I, I fit into my seat different than the next guy, I want to have a facility looking more suitable for my personality and my life, so I really want to say, hey, I like this one, but I would like it differently, so they need to…they really need to, to take an active role and say, This is what I want, okay, and this is what I like or don’t like, so that way they’re not selling you a design that had been already done for somebody else that may not be appropriate for you. Because we all want to have that unique thing, okay? So, that’s your chance to have that, your unique, input into the design when you have three, when you…no, you take whatever it is that , if they… someone gives you few different layouts, find the thing, the one that you really, really like, and pin it down to just three. And them that way you can rule and say I like this, this is, you know, the majority of this I like, and I like some of this, can you blend that together, okay? But, they, they have, they have to take a proactive role, otherwise, those people, no, your designer, that’s your architects and your suppliers, will design exactly what they think you want. Howard Farran: I want you…I’ve only got you for, seven more minutes, talk about your online CE course, and about, on Dentaltown. I mean, it’s wildly popular, everybody obviously says you’re the number one authority on office design. HanH H. Tran: Well Howard, I, one, I appreciate being on Dentaltown, giving me the opportunity to present on Dentaltown. the CE course was not put together to tell you what, you know, what nuts and bolts to use. It mainly, what a lot of things that you’re not exposed to when you look at, designing offices, what happens around you, okay? What are the things, that you need to do, who gets to do what and who has the authority, who’s best suited for the job, alright? you know, everybody that has a spool of yarn and a door thinks they’re dentists. Well, we know that’s not the case. Well, anybody that owns a pencil and a ruler can’t simply qualify themselves as an architect. So, you have to find who is the best individual with the best training, and that can actually lead you through the whole process, understand, who does what and when, and what you can expect through the whole process. That’s why that CE course was put together. It gives you options before you actually start to write the very first line on paper. So, that way you know, whether the process of how, do I want to hire a builder that is just going to hire everybody to command the whole thing, and I tell him I’ve got $300,000 to build, they say, I will build you exactly $300,000, and everybody will go home happy. Or, there will be a design built. Or do I want to have, you know, the creative juice go as far, as much as I can, so I have that perfect environment, that perfect design for the budget that I can live with, and then I bid it out to find the best people that can build it, and then they build it. So, the designer, they, you know, they design, bid, and build. Most, most dentists don’t know the difference. Okay, so the course gives you at least some idea what is, you know, what is your option, what are you comfortable with, and why and who has control of what until when? So, I, I think it’s a, you know, it’s a course that really gives a lot of input that, gives value before they actually get down to the design process. And certainly who would love to design it once they actually see it and go, You know, this makes sense to me, that makes sense to me, now I can talk to you more about it. Howard Farran: Well, like they say in construction, in carpentry, measure twice, cut once. And to have someone do their first dental office for you is just absolutely crazy when there’s guys like you who could bring so much invaluable expertise. So, how do these dentists get a hold of you? What do you…tell them your website, contact information, what if I’m listening to this out there and I, I don’t know what to do. I’m in Parsons, Kansas, and I’m, I’m thinking, but I’m not sure. Howard Farran: I want to do townie a favor. HanH H. Tran: Thank you, Howard. I welcome the opportunity to start a dialogue. When you contact us at hjtdesigngroup.com, or hjtdesign.com, that’s our website. Howard Farran: Spell it, spell it out slow one time. Howard Farran: Do you give out your email? HanH H. Tran: My email address is htran@hjtdesign.com. You can also reach me on my cell phone, 419-410-1562. HanH H. Tran: (Laughs) That’s alright. And you know, one is that I want them to have the opportunity to get the information they need before they make a decision, okay? Because everybody wants to sell you things. The thing is, if you are informed, you make better decisions for you, you’ll be a happier individual, you will get, you know, you’re looking for value and I assume that’s, that’s why you’re doing the research and, and you read and things like that. so, the value is that, what is it that you need to do first – it depends on what you try to do, you will need to know who and what you need to do first, not just simply, you know, I need to buy the equipment and build it, and then I build my building around it. you know, do your research. Howard Farran: But HanH, how, how early should they be contacting you? I mean, should I wait until I’ve bought the land and I have financing for the building? I mean, how early do you like to start communicating with the dentist who’s thinking this up? HanH H. Tran: Howard, you…before you buy the land, at least you need to know how big of a piece of land you need, okay? But, before you decide on how big of a land you need, you need to know what is it, what is the size of the facility that you ultimately want built on that land. Let’s say, five days from now, ten years from now, what it would look like once it’s all complete, if you’re going to do it in phases. So, you decide on the size of the building and then you decide the amount of land you need. you know, just simply because, the…in theory, if you, if you need an office building this big, and you multiple it by seven or nine to give you the size of the land, but the land has…a third of it is underwater, you’re not going to be able to build it, okay? So, you have to, you have to do your research. Talk to your professional before you go out and you do those things. You don’t go out and buy a house and then say, I want to convert it into a dentist’s office without knowing all the issues associated with buying a house, and converting a house to a commercial space. Howard Farran: Well, here’s, here’s …here’s what I want to say to my dentist buddies, when they go accepting people in dental school, it’s a natural selection. When you screen them out, you have to get A's in calculus and physics and chemistry and biochemistry and all that stuff, the natural selection is an introvert scientist-type person and they’re shy, and what I want to say is, to these dentists out there, if you’re…I know, you’re shy, I know you don’t like to reach out, I know you don’t want to waste time, but if you’re even thinking about what to do, he just gave you his cell phone number, dude. Call him and, and you need a buddy and you need someone with a lot of experience to walk you through this process. It’s a lot of money, it’s a lot of decisions, and I know…I’ve heard so many townies tell me that, you are the greatest part of the entire process, so, HanH, on that note, we’re out of time, thank you so much for being the moderator on the dentist office design forthank you for your thousands of posts, thank you for everything not only that you’ve done for dentistry, but for Dentaltown, I am truly…it has been an honor to interview you for an hour. HanH H. Tran: Thank you Howard, I appreciate spending time with you. Howard Farran: Have a great day. HanH H. Tran: You, too. Take care now.